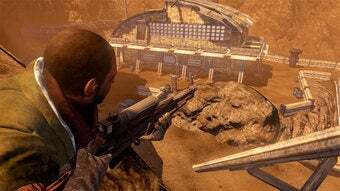 Red Faction: Guerrilla is the third game in the series from Volition. This is a somewhat substantial change to the series has the first two games have been from the first-person perspective. The story takes place about 50 years after Red Faction 1 and 2, and takes place completely on the surface of Mars. Not in the mines. It's more of an open-world game where you can walk or drive anywhere at anytime. The big hook in this PC, PS3 and Xbox 360 game is that every single building and environment piece can be destroyed. I timed 10-minute single player demo on the New York Comic Con show floor. The demo was in alpha form with the full gaming coming this June to the PS3, Xbox 360 and PC. Emptiness inside you: Since all the buildings are destructible, they aren't really filled up with anything. Most of the rooms are completely empty of furniture. In fact everything I noticed that can be blown up is basically hollow. No Digging: Unlike previous games in the series where you could burrow a hole for seemingly ever and ever, Guerrilla makes it so you can't get down and dirty. Jumping: While the controls in general are fine, I found the jumping to be just a little wonky, especially when going up alongside a steep incline. Geo Mod 2.0 – The level of destruction is just awesome. Nothing really implodes the same way twice. Ever. I spent most of my time simply throwing remote mines on different areas of structures and detonating them to see the varying result. Stay down! : What I love probably more than anything else about this game is that anything you blow up stays so the entire game. The only buildings that reform after time are story-based ones. But everything else stays in pieces. Graphics – You might not notice it right away, but the look of this game is really crisp and colorful. Volition did a great job with this. Probably my surprise game of the show, if I had to pick one. I like the changes they did to the series and it seems like I could spent a lot of time blowing stuff up! Oh, there's a pretty good game here, too. I really hope Volition decides to do a demo before its release.